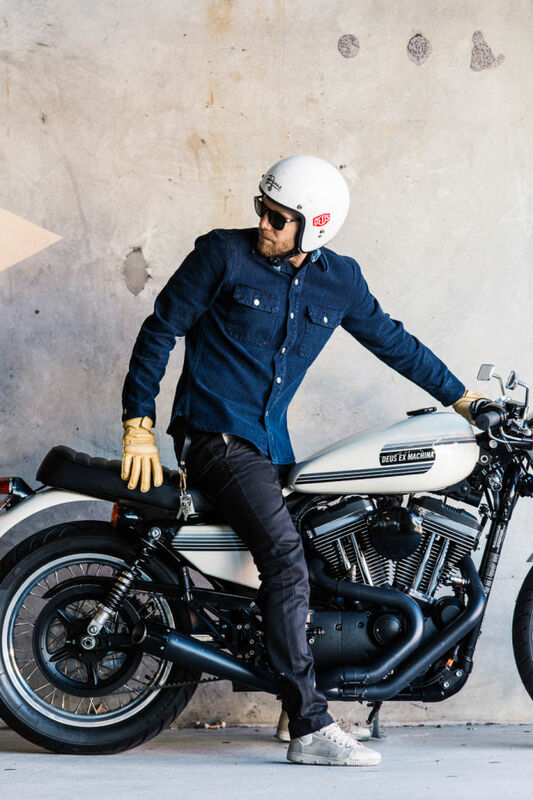 A CUSTOMIZED HARLEY BY DEUS EX MACHINA - "THE GENTLEMAN JIM"
James J. Corbett aka Gentleman Jim was about as tough as they came, pure bred American boxer, with a reputation for packing a hard punch in the ring. Like his nickname suggests, he also was a man of fine taste and manners, a mean son-of-a-gun with class. 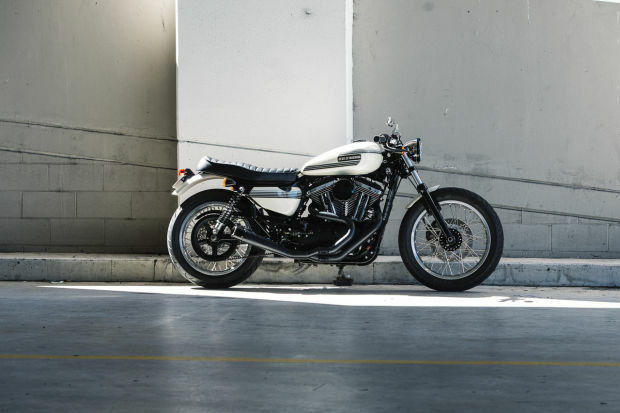 So it seems like this 2008 Harley Davidson 1200 EFI Sportster and good old Jim have a lot in common – Both from the US of A and both known for their hard punches and style. At first glance, certain angles trick you that this is indeed a British steed, a true gentleman’s ride. However slide side on and it becomes clear that a little rough trade is at play. Rather than shoe horn Harley’s injected 1200 twin into a Norton or some such chassis, Jeremy chief tech of Deus Camperdown decided to sever the sub-frame from a Kawasaki W650, and graft said appendage to the Sporty’s rear end. This achieves a linear horizontal from tank to seat, otherwise difficult with the stock HD sub-frame. The donor brute is a 2008 Harley Davidson 1200 EFI Sportster. The Standard 21/16 wheel configuration is moved on for stately alloy 19 inch front and 18 inch rear wheels, stainless laced to custom hubs. Revised fork internals and alloy bodied Icon rear damping units ensure the ride is most satisfactory. Tingate swan neck clip-on bars aid the cafe styling, however without the severe lean forward of some cafe racers. Adjustable Sato Racing rear sets compliment the package. Custom front and rear fenders offer strength in elegance with the rear crowned by a Lucas style tail light. The seat is a custom unit as are the mirrors, head light, brake lines, and speedo, while the top clamp is a standard unit filled with alloy and smoothed over. Custom RSD 2 into 1 exhaust provides a pleasant note suitable for any gent. 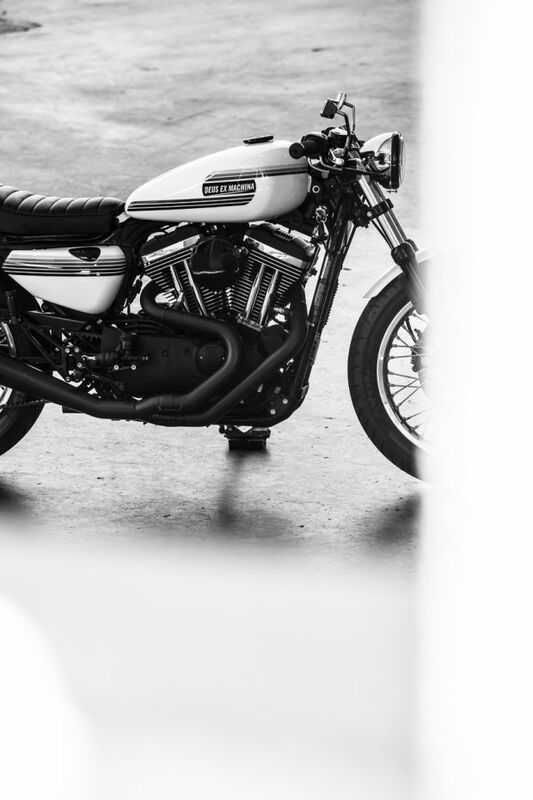 Paint is stunning and inspired by the interesting days of AMF Harley, this accompanied with careful use of satin and gloss black maintain a handsome stance. Enjoy the elegance of power – impeccably dressed.